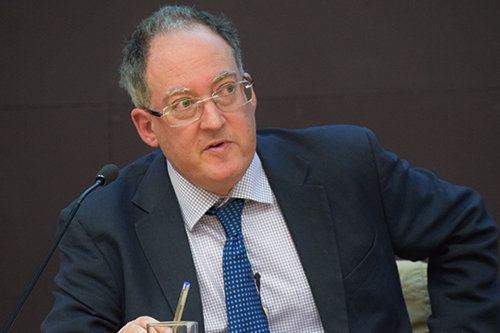 The rise of state-funded journalism and the growing influence of social media are among the biggest threats to foreign news reporting by western media, according to Gideon Rachman of the Financial Times. 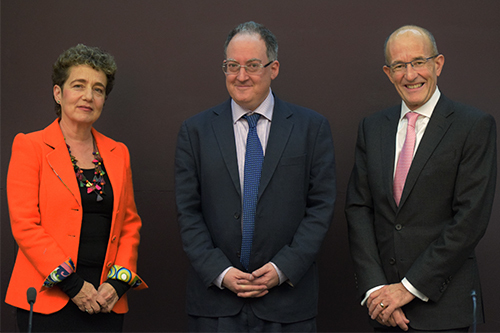 Delivering the 2016 James Cameron Memorial Lecture at City, the FT’s chief foreign affairs columnist (right, with Professor Suzanne Franks and Professor Sir Paul Curran) outlined the challenges and opportunities facing his profession. He also praised the work of the revered British journalist James Cameron, whose legacy is remembered with an annual lecture and award. “The best journalism of the kind practised by James Cameron will always find an audience,” said Rachman as he closed the lecture. The journalist explained that western media narratives were “increasingly under challenge” from media funded by countries such as Russia and China, which use “deliberate and well-funded efforts to distort the truth”. Rachman added that Russian media were more sophisticated than in the Cold War, while Chinese media were now catching up. The rise of social media had also helped state-funded outlets to spread their messages around the world. “The whole question of authorship and origins is in fact increasingly hard to pin down in the age of social media,” he said. Rachman explained the growth of the internet had enabled media to identify audiences and their interests, but this had exposed the fact that foreign news was unpopular. The columnist added it took confidence for journalists and media to publish stories that they believe are important but know will not be widely read, stressing that recognising the outside world was essential for democratic countries. “Syria, I think, is the most important international story of the moment but readers find it depressing, they find it confusing and it’s a long way away,” he said. Rachman claimed the third threat to foreign reporting is the way that traditional western media are financed, with the decline of print and influence of the internet forcing companies to cut back their overseas operations. However, he said this meant there were more opportunities for freelancers, who also no longer need a film crew to do their work. The James Cameron Memorial Award was given to BBC International Correspondent Ian Pannell, who said being selected was a "huge honour". The Special Award went to David Walsh of The Sunday Times.